For instances where standard PID control does not provide optimal results, MANTRA advanced process control software can be used to provide supervisory control for these difficult process control loops. MANTRA software is a PC-based supervisory control system with a graphical programming environment for easy implementation and maintenance. Leveraging a suite of patented model-based control technologies and executing on your control network, MANTRA software runs control calculations in real time in conjunction with your existing DCS, PLC or plant-wide information system. ControlSoft engineers can help you design model-based controls within MANTRA software and also make modifications to your DCS/PLC control logic to reliably and safely implement advanced process control in your plant. Intuitively build basic and advanced control schemes in the MANTRA application developer. Simply create a block diagram within a project, and drag and drop objects onto the diagram, adding inputs, updating parameter types, and placing them in sequence to perform the necessary control functions to regulate and control your application process. MANTRA software provides the ability to make changes to your project, without disrupting your operations. You can make incremental changes to your running project as needed, and update your project while avoiding costly shutdowns. 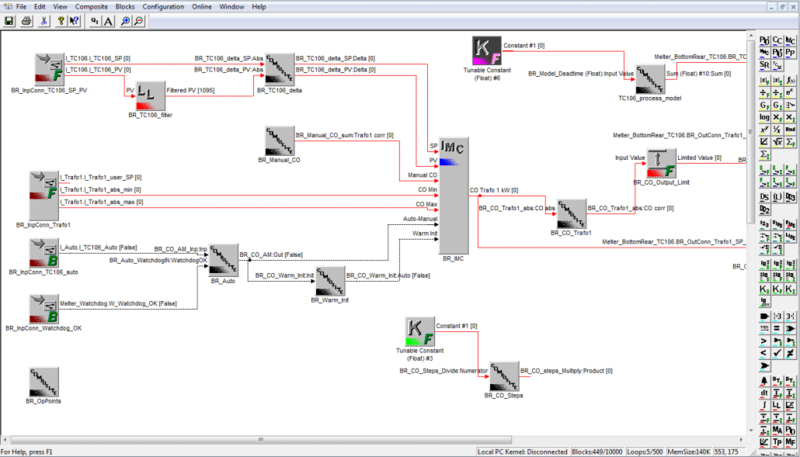 Work with a library of control algorithms that are packaged in easy-to-use function blocks. Each block is an object and can be manipulated graphically to add inputs, change parameter types (input to tunable or vice-versa), or even encapsulate several blocks in one. Built into all the control blocks are advanced features such as feedforward, tracking, and alarming. Combining PID with special functions (like time proportional, position proportional, and lead-lag compensation) can help to easily develop complex process control schemes. Coordinated Control (CC) – use to control a single process variable to its setpoint using multiple controller outputs. Modular Multivariable Control (MMC) – use to control multiple process variables to the setpoints using multiple controller outputs. Cascade PID (PID2) – use to implement an outer loop/inner loop PID controller; sometimes two controllers can do a better job of keeping one process variable where you want it. Multiple Parameter PID (PID+) – use more than one set of PID parameters to control a PID block. Time of Day Pumping (TDP) – Optimize pumping schedules based on energy costs. MANTRA software uses industry-standard OPC communications for reading live process data and periodically writing calculated optimal outputs and setpoint settings to your PLC/DCS system. MANTRA executes on a PC with Vista / 7 / Server 2008 / 8 / Server 2012 / 10 / Server 2016 operating systems. Both 32-bit and 64-bit operating systems are supported. The PC may be one that already exists at site, conditional on meeting the requirements. Important: The latest Microsoft updates are required for all supported operating systems as of April, 2018.